Cardiology is a branch of medicine dealing with disorders of the heart be it human or animal. The field includes medical diagnosis and treatment of congenital heart defects, coronary artery disease, heart failure, valvular heart disease and electrophysiology. Physicians who specialize in this field of medicine are called cardiologists, a specialty of internal medicine. Pediatric cardiologists are pediatricians who specialize in cardiology. Physicians who specialize in cardiac surgery are called cardiothoracic surgeons or cardiac surgeons, a specialty of general surgery. Pulmonology is a medical speciality that deals with diseases involving the respiratory tract. 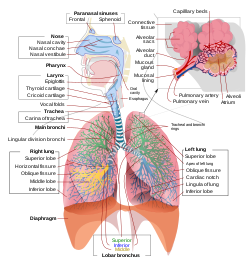 The term is derived from the Latin word pulmō, pulmōnis (“lung”) and the Greek -λογία, -logia. Pulmonology is synonymous with pneumology (from the Greek πνεύμων (“lung”) and -λογία, -logia), respirology and respiratory medicine. Pulmonology is known as chest medicine and respiratory medicine in some countries and areas. Pulmonology is considered a branch of internal medicine, and is related to intensive care medicine. Pulmonology often involves managing patients who need life support and mechanical ventilation. Pulmonologists are specially trained in diseases and conditions of the chest, particularly pneumonia, asthma, tuberculosis, emphysema, and complicated chest infections.